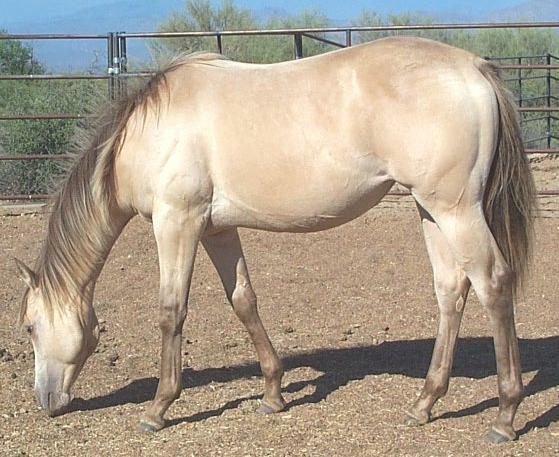 If a Gold horse has one cream gene from either parent, it's a Gold cream. 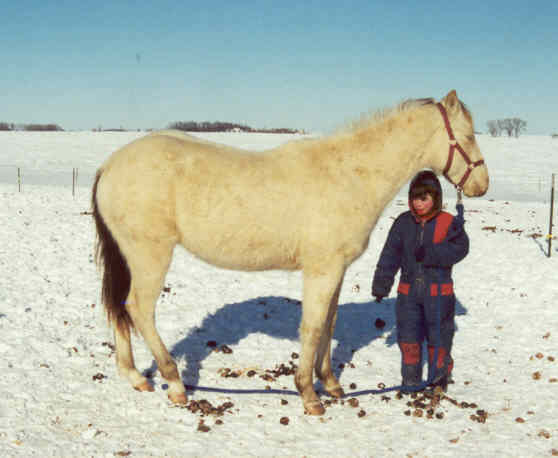 Left, Chenoa, when she was owned by Tara Novotny. Top right, Brooke's Wind Dancer TWH stud owned by Renee Woodward. Bottom right, Sundance Lasan, GOLD CREAM AQHA stud, owned by Chuck Harrell of Texas. 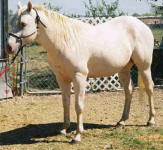 If an Amber Champagne horse has one cream gene from either parent, it's an Amber cream. 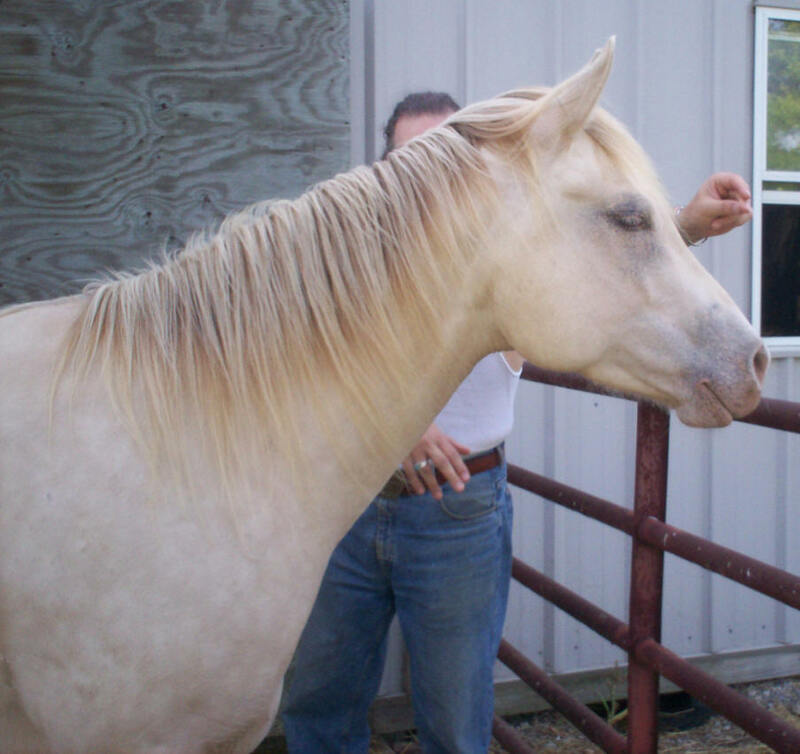 At left, Sugar Champagne Lace, AQHA filly owned by this webmaster; at right, Skipper Dee Doc Ivory. The mane and tail can range from brown, as on Ivory, to extremely frosted, as on Sugar. If a Sable Champagne horse has one cream gene from either parent, it's a Sable cream. At left, Ashwood Skipa Star ("Kya"), a sable cream AQHA filly formerly owned by Kaeden Novotny. At right, a Sable cream AQHA mare, WFR Sugar Cookies, owned by Kaeden Novotny. Thanks to Tara Novotny for the pictures. 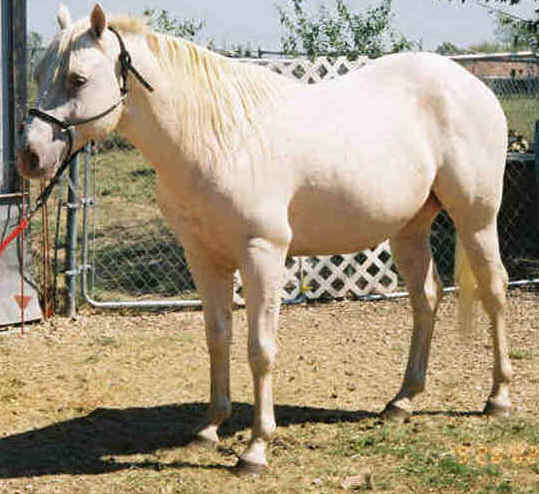 If a Classic Champagne horse has one cream gene from either parent, it's a Classic cream. 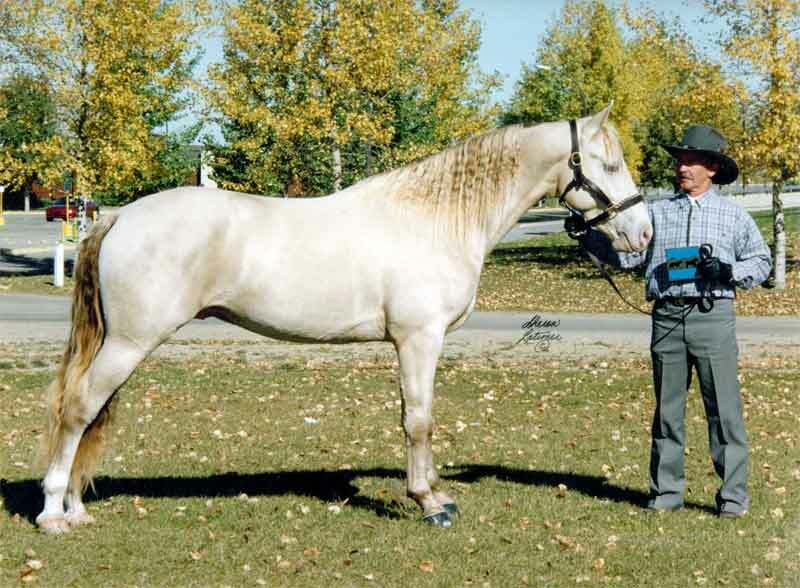 At left, Topaz Merry Go, Tennessee Walking Horse stallion, owned by Bill Howes of Canada. 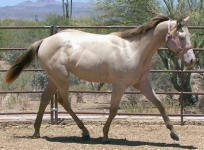 At right, Vanzi Te N Te Glo, Quarter Horse filly owned by Kaeden Novotny of Arizona . Any Color + 2 Cream genes + Champagne = Champagne Double Cream. This horse will look practically white, with very pale pink skin and hardly any freckles. It must have a Cream Champagne parent and a Cream parent. It will always throw one cream gene and should produce Cream Champagnes as well. 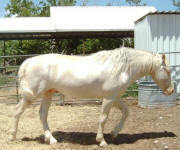 These two have tested CrCr, and have each produced at least one cream champagne foal. At top left, Legacy's Frontier Gold Tennessee Walking Horse colt, a Gold Double Cream (Cremello Champagne) owned by Edna Edwards of Utah. 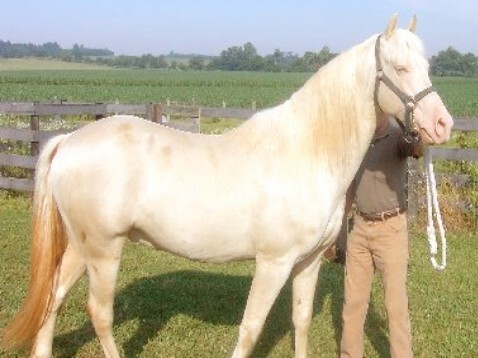 At top right, Wind D.’s Thunder, another Tennessee Walking Horse stallion. 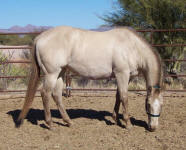 He is owned by Leroy Summers, and was bred by Renee Woodward, both of whom are from Kentucky. 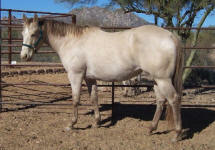 More recently an Amber double-cream colt has been brought to our attention. 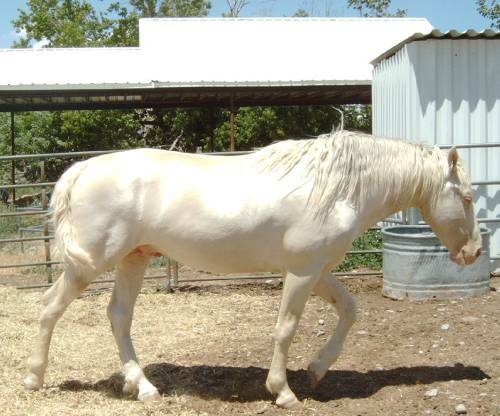 He is a Missouri Fox Trotter named 1man's Apollo, owned by April Brede in Draper, Utah. The colt was born with unexpectedly dark ear and tail hair, center and bottom left. A huge, slightly older picture of him is at bottom right. I've left it huge so that viewers can see the eye, sheath, etc. skin in as much detail as possible. We hope to add more pictures when he matures. 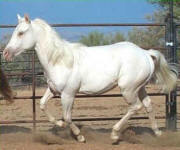 His color test results are on file with the ICHR.